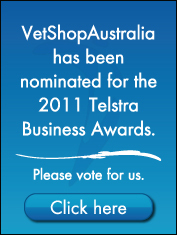 "On behalf of all the team at VetShopAustralia, I would like to thank our wonderful customers for nominating us for the 2011 Telstra Business Awards. I would also like to announce that we have decided that we will be donating the $2,000 prize money to a charity of our customers' choosing if we win." Please vote for us by going to the Telstra Business Awards website.